Australia’s $63 billion* agriculture sector stands to benefit from a revolutionary fuel technology that will convert multiple agricultural waste streams into valuable biofuel and green chemical products for the first time. In partnership with the University of Newcastle, Newcastle Institute for Energy and Resources (NIER) and Muswellbrook Shire Council, Ethanol Technologies (Ethtec) has received $11.9 million in funding from the Australian Renewable Energy Agency (ARENA) to establish a demonstration facility at Muswellbrook. In addition to ARENA funding, the $48 million project will be funded by $11.9 million from industry partners as well as contributions from Muswellbrook Shire Council and the University. Led by a group of researchers including conjoint lecturer and Ethtec senior biotechnologist, Dr Geoff Doherty, the project will develop an environmentally sustainable process to produce biofuels and other renewable chemicals from crop and forestry wastes. Currently farmers need to decide whether their crops are used for food or fuel production, as ethanol is produced from the valuable food portion, known as ‘first generation technology’. Ethtec technology will eliminate the food versus fuel tension as the process will use the waste streams left behind once the food portion has been harvested from crops, known as ‘second generation technology’, which will also give farmers a second source of income. The project will help create a commercially viable process for the country to tap into a $130 billion ethanol industry that currently only makes up approximately one per cent of Australia’s fuel consumption**, and will provide a pathway to a sustainable export market for Australian produced ethanol. Ethtec’s novel ‘strong acid’ technology will use feedstock waste streams such as wheat straw, cotton stubble, sugar cane bagasse and forest material left behind after the valuable food and fibre components have been harvested from crops and timber plantations. “This project is about developing the engineering data behind the process to ensure it is commercially viable. We know you can take waste streams, convert them into sugars and then turn those sugars into biofuels or green chemicals, but it’s got to be competitive with crude oil products. “The overarching benefit of this technology will revolutionise agribusiness because farmers will be able to continue to grow crops, sell the valuable part into the food market and have a second market for the left-over waste stream. “Creating a value for fibre will also incentivise land rehabilitation programs, such as mine rehabilitation and the planting of trees to remediate high salinity soils. At the moment, most farmers don’t do it because it’s worth nothing and takes their fields out of action for many years. This process will keep their land productive while also being remediated,” Dr Doherty explained. With 98% of Australia’s transport energy still derived from fossil fuels, Dr Doherty said Australia was lagging behind the rest of the world in the bioenergy sector. “By displacing a litre of petrol with second generation ethanol, greenhouse gas emissions can be reduced by over 90 per cent. A lot of other countries are developing bio economies and finding ways to make biofuels and green chemicals from their agricultural resources, whereas we’ve had such a good run with our resources sector that we haven’t been forced to innovate. “I think it’s widely recognised now though that we do need to start innovating, particularly if we want agribusiness to thrive,” he said. Not only will this technology reduce the environmental impact of ethanol production, but it also has the potential to reduce the cost of biofuel and could be used to produce renewable plastics, industrial lubricants and even pharmaceuticals. Research on the project will be carried out in phases over the next three to five years and will be tested at a demonstration facility based in Muswellbrook. “Our demonstration facility is where we convert the feedstock to sugars in solution, which is then fermented to ethanol and potentially other biorenewable products. This pre-commercial facility can process around two dry tonnes of biomass per day and will be used to generate the engineering data to construct commercial scale plants with a biomass processing capability in excess of 250 dry tonnes per day.” Dr Doherty said. Dr Doherty will work with Professor Peter Lewis from the School of Environmental and Life Sciences to refine the fermentation processes of converting sugars into valuable energy and other biorenewable products. “With respect to the use of plant waste material, relatively little is known about how that waste can be efficiently used for the production of valuable products,” Professor Lewis said. “This phase is vital to the overall process of the project. The Ethtec process can efficiently reduce greenhouse emissions that can be applied to a wide range of plant-based waste and will enable the technology to be adopted around the world in medium to large-scale facilities,” he added. The University, through Professor Richard Bush from the International Centre for Balanced Land Use, will leverage off the technology to drive economic diversification of the region. 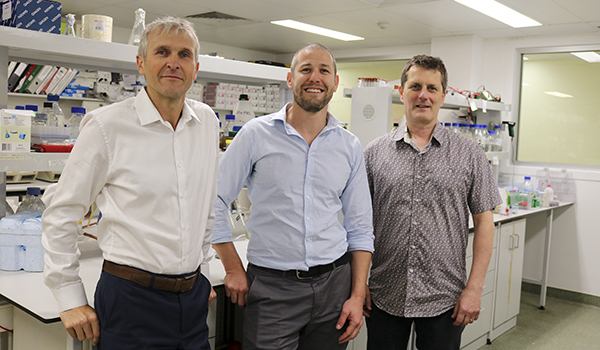 “This University will capitalise on this unique technology and its regional location to develop an advanced bioeconomy in the Hunter Valley, bringing together stakeholders and land managers from across the value chain to create new jobs and enterprise,” Professor Bush said. Ethtec has formally partnered with the University’s Newcastle Institute for Energy and Resources (NIER) and Director, Professor Alan Broadfoot, said the project poses a wide range of environmental, social and economic benefits. “We are proud to be collaborating with Ethtec and look forward to seeing the outcomes of this revolutionary project applied to agricultural and renewable energy sectors across Australia into the future,” Professor Broadfoot said. Ethtec’s managing director and founder, Dr Russell Reeves, an alumnus of the University, said the complementary skills across the project partners will improve its chance of success. “We believe it is a very natural fit that Australia’s leading regional university has partnered with us to develop what we believe is Australia’s most innovative region-based technology,” Dr Reeves said. Ethtec has invested over $18.6 million in the project to date, with $15.6 million coming from shareholders and $3 million from the Federal Government.